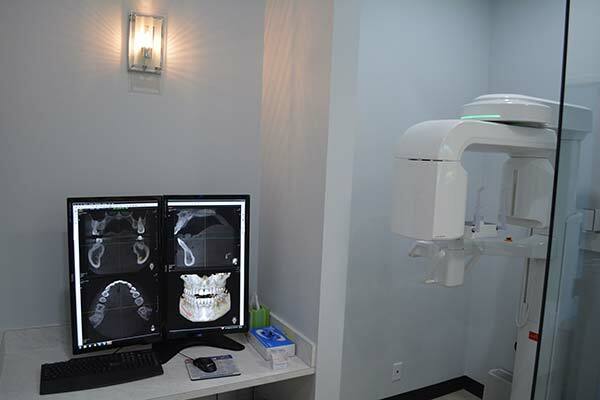 At Edge Dental, we utilize 3D imaging which allows us to better understand the anatomy of your mouth. By using this state-of-the-art technology, Dr. Justin Lai will be better prepared to accurately diagnose potential issues and develop the best possible treatment program for you. The field of dentistry has seen some pretty incredible technological developments in recent years. All of these developments have greatly improved our ability to diagnose issues, your dental treatments, and the quality of care you receive. At Edge Dental, we are proud to use the latest dental technologies in our office to provide you with the effective dental care you deserve. 3D digital X-rays provide us with a unique look at all of the structures inside your mouth, including the soft tissues, bones, teeth, and nerves. A cone-shaped X-ray beam rotates around your head, capturing a series of images that are pieced together to create a single 3-dimensional image on a computer monitor. We are then able to use this image for a variety of different purposes, including diagnosing impacted wisdom teeth, determining optimal placement for dental implants, determining the need for a bone graft or sinus lift, and assessing the internal anatomy of a tooth for a root canal. 3D digital X-rays use technology similar to digital X-rays while producing images that are similar to those produced by a traditional CT scan. It takes less than 60 seconds to capture an image and you are exposed to much less radiation. An intra-oral camera provides us with a technological advantage over the traditional metal mirror used during dental exams. This handheld wand, approximately the size of a large pen, has an optical camera on one end and is attached to a computer on the other. As the camera is moved around in your mouth, it captures real-time images, which are displayed on the monitor, allowing us to take a look at the hard to see areas of your mouth in a much more comfortable manner. We can also capture still images, which enables us to take a closer look at different areas of your mouth without you having to keep your mouth open while we examine the details. Specialized software allows us to zoom in and enhance the images for clarity so that we can spot the smallest details. These features, then allow us to make much more accurate diagnoses of different oral health issues and therefore provide you with much more effective treatment plans. There are an incredible number of people who even avoid the dentist entirely because of their fears. We are here to tell you that when you walk into our office you have nothing to worry about. Sedation dentistry is a great option for those individuals who have been too worried about the dentist’s office to actually come and visit. We can help you feel comfortable! The dental technology we use in our office has enabled us to provide you with the highest quality of care, optimizing your oral health. For more information on any of the equipment we use in our office, call Edge Dental at (281) 940-8940 today.